The name of the General Sports Director of Lazio, and former renowned Albanian footballer Igli Tare, is mentioned in Katania's Prosecution's file regarding the mafia network that has been destroyed this Wednesday relating to online sports betting. Among the thousands of pages of interception, among other things, in the Italian accusation body is also mentioned also Igli Tare and his brother Genti Tare, currently Honorary Consul in Turkey. 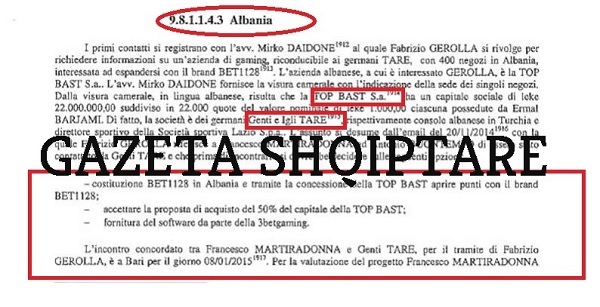 "The first contacts are registered with the lawyer Mirko Daidone to whom Fabruzio Gerolla addresses by requesting information on a betting company run by Tare brothers, with 400 stores throughout Albania, interested to spread under the name BET 1128. The Albanian society, for which Gerolla is interested, is 'Top Bast'. Results that that Top Bast has a caps of 22 mln lek, divided into 22,000 terms with nominal value 1000 leke each, in possession of Eraml Bajrami. But based on facts, the company is owned by the brothers Genti and Igli Tare, respectively consul of Albania in Turkey and sports director of Lazio. " According to the Italian authorities' investigations, the fraud scheme was built by a company registered in Curacao, which is owned by an Albanian company "Remonte Betting solution" used by mafia groups. The total value of sequestered property is at least 1 billion euros. While it is thought that this mafia scheme has brought revenue that climbs over 4 billion euros, much of which is invested in most of the immovable property. During the operation, 68 people were arrested, while the activity spread to over 10 different countries all over the world, including Albania.